Wear comfortable shoes and loose clothing to allow you to exercise. You may have to wear a gown for the upper body only. Ask your health care provider if you should take any of your regular medicines on the day of the test as some medicines may interfere with test results. Never stop taking any medicine without first talking to your doctor. Tell your doctor if you are taking sildenafil citrate (Viagra), tadalafil (Cialis), or vardenafil (Levitra) and have taken a dose within the past 24 to 48 hours. The technician will place 10 small pads (electrodes) on your chest/upper body. These patches are attached to an ECG monitor that follows the electrical activity of your heart during the test. You are then shown how to use the treadmill. You will need to exercise for several minutes. The exercise is very easy at first. Then it slowly gets harder. You should exercise for as long as possible. Your heartbeat and blood pressure are monitored during and after the test. 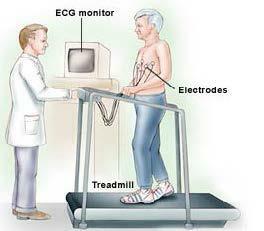 You will be monitored for 10 - 15 minutes after exercising, or until your heart rate returns to baseline. The total time of the test is around 60 minutes. As soon as the test is over, you may eat and return to your normal routine. Ask your doctor about taking any medicine that you were told to skip before the test. You are having chest pain (to check for coronary artery disease -- narrowing of the arteries that feed the heart muscle). Download the Exercise Stress Test Information sheet here.